Want to be notified of new releases in scipr-lab/libiop? This library provides zkSNARK constructions that are transparent and post-quantum, and moreover rely only on lightweight symmetric cryptography (any cryptographic hash function). 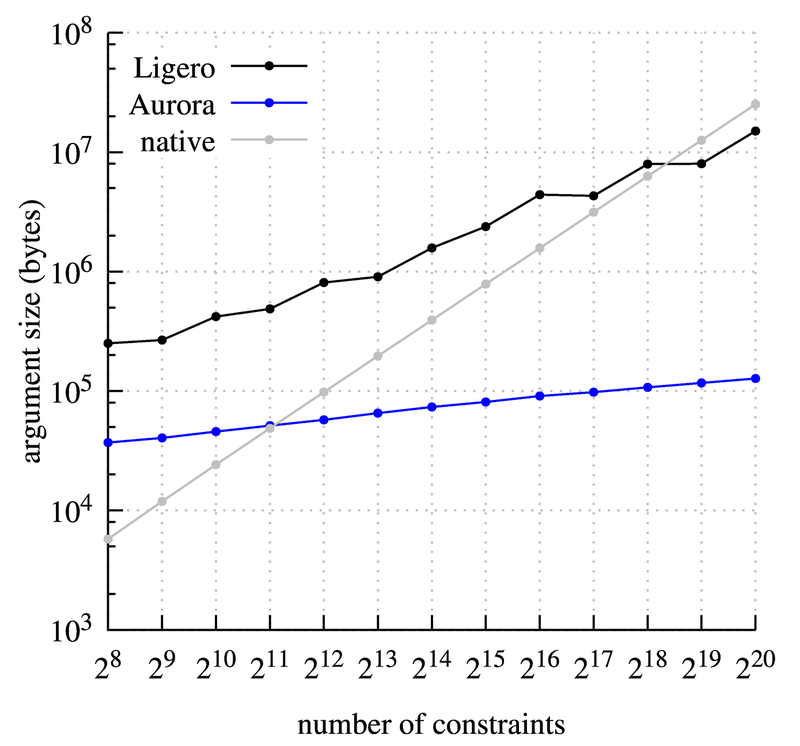 The Ligero protocol from [AHIV], whose argument size is O(N0.5). Both of these zkSNARKs support R1CS, an NP-complete relation that generalizes arithmetic circuit satisfiability. An important component of Aurora, which is of independent interest, is the FRI proximity test. These protocols all support binary extension fields, and smooth prime fields. WARNING: This is an academic proof-of-concept prototype, and in particular has not received careful code review. This implementation is NOT ready for production use. Interactive oracle proofs (IOPs) are a multi-round generalization of probabilistically checkable proofs (PCPs). Known IOP protocols have much better (asymptotic and concrete) performance compared to PCP protocols. post-quantum, because no attacks are known on the BCS transformation. Moreover, since no cryptography beyond the hash function is used, non-interactive arguments obtained via the BCS transformation are relatively lightweight (in terms of computational resources). Finally, the BCS transformation preserves zero knowledge, in the sense that if the underlying IOP is (honest verifier) zero knowledge then the resulting non-interactive argument is zero knowledge. This library provides zkSNARKs obtained via the BCS transformation. The folder libiop/iop contains infrastructure for writing IOP protocols. The first is an IOP from the Ligero paper, and the second is an IOP from the Aurora paper. Efficient IOP protocols such as the above are obtained by combining two components: (1) RS-encoded IOP, and a (2) proximity test for the RS code. (See this paper for more details.) The codebase in this library provides infrastructure that enables generically composing these components. The folder libiop/protocols/encoded contains RS-encoded IOPs. This includes the RS-encoded IOPs that form the core of the Aurora and Ligero protocols. The folder libiop/protocols/ldt contains proximity tests for the RS code. This includes a direct test (used by Ligero) and the FRI protocol (used by Aurora and other IOPs). 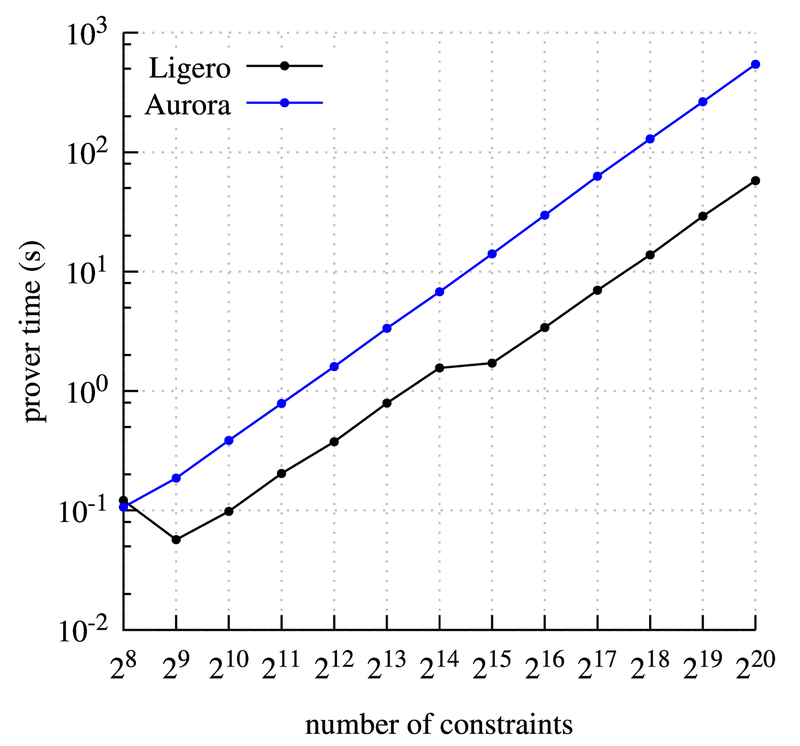 : More precisely, the Ligero paper only describes a construction for arithmetic circuits. 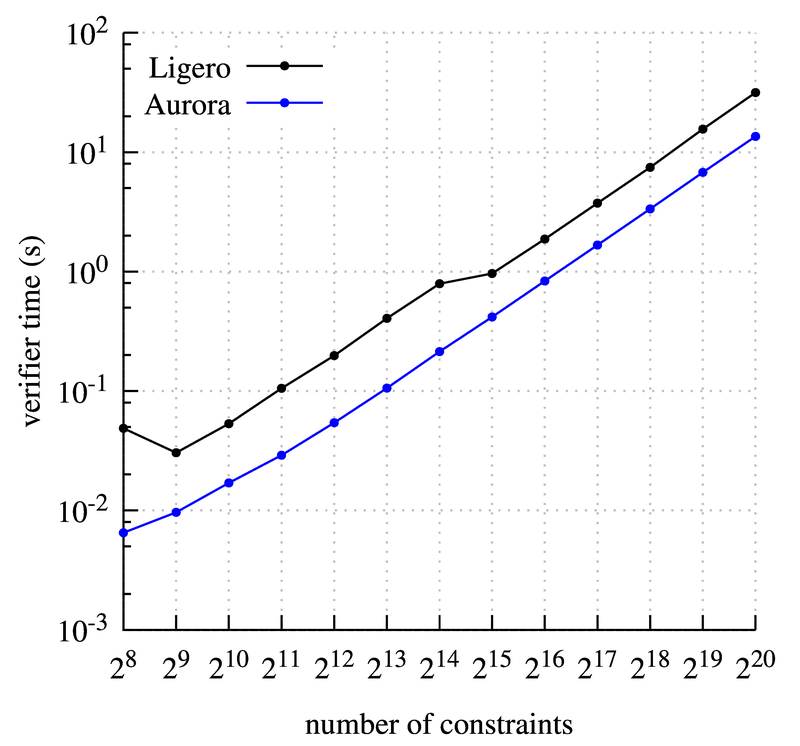 An appendix of the Aurora paper explains how to extend the construction to support R1CS. The latter is the implemented protocol. The folder libiop/snark/common contains the BCS transformation as a standalone component. The folder libiop/snark contains zkSNARKs obtained by applying the BCS transformation to the IOP protocols above. κ is used to denote the asymptotics dependence on the security parameter explicitly. A flag make_zk can be set to indicate that the transformation should preserve zero knowledge, or not set to indicate that the IOP being transformed is not zero knowledge and so there is no need to preserve zero knowledge. Test files are in libiop/tests. This work was supported by: a Google Faculty Award; the Israel Science Foundation; the UC Berkeley Center for Long-Term Cybersecurity; and donations from the Ethereum Foundation, the Interchain Foundation, and Qtum.